There are many citizens of this state and country who are eligible to vote but do not bother to register. Every citizen of the United States over the age of 18 is eligible to register and vote. For most people, registering to vote isn’t something they think about unless it is getting close to a major election. Many people may wonder why it is important to register. If you don’t register, you can’t vote. If you can’t vote, you effectively have no voice in your government. Being able to vote gives you a say in who represents you on your local council, in your county, in your state, and on the national level. At any election in your area, one of the candidates will be selected to represent you . . . whether you have voted or not. If you’re registered and vote, you’ll have the chance to have a say because you voted. You may think you don’t want to vote now, but if an issue comes up that you feel strongly about, if you’re registered, you are prepared to have the chance to vote on it. Often, people are quick to say when they disagree with politicians; but if they don’t register and don’t vote, they have given away the “right” to give their opinion. Everything is “political,” and political decisions will be made for you even if you elect not to participate. You still have to pay taxes, roads still have to be built, regulations and laws will be passed, and so on. If you don’t vote, local, county, state, and national decisions will be made without regard to your opinions. The “system” will never be perfect, but by your participation, it can be improved. Throughout the world, people have died fighting for the right to vote–by registering to vote you’ll be showing that you think that right is important and you value the sacrifice. If you are new to this state, you may wonder how you go about registering to vote. You obtain a voter registration card from your local county government office, the county elections administration, or DMV office. Many people will register when they get or renew their driver license. If you have moved within the state, you may register by either visiting the local County Elections Administrator office or filling out the online application. You will receive your updated voter card within 30 days. Please note: “If you are late to register in your new county, you may be able to vote a “limited” ballot on candidates or issues common between your old and new counties.” See VoteTexas.gov for other restrictions. If you are registered and move within your county, you may simply flip over your existing card and write your new address on the back and mail it to the local County Elections Administrator. You may also go to VoteTexas.gov for other options. How do I know if I’m already registered? To find out if you are already registered to vote, visit the Secretary of State’s website and provide the necessary information, or check the local County Elections office. If you are unsure that your ID is a valid form, see the VoteTexas.gov website for more details and instructions. The last day to register to vote in the 2016 Texas primary is January 29. The results of the voter turnout in this Primary will not only have a direct effect on whom the presidential nominees will be for both parties but also for all down ballot races, including your congressional representatives, state senators, state representatives, and judges. In Texas, we have Early Voting. This means that for two weeks before an election you can vote anywhere within your county during the Early Voting period. Early voting locations are convenient to your home or work and often have a short waiting time. Be sure to check your county elections administration website for early and Election Day voting locations, dates, and times. On Election Day, you must vote in your voter precinct’s assigned polling location. Every effort is made to ensure that these locations are as convenient as possible. Election Day polling sites are listed in your local newspaper and will be posted on the county elections’ administration website. 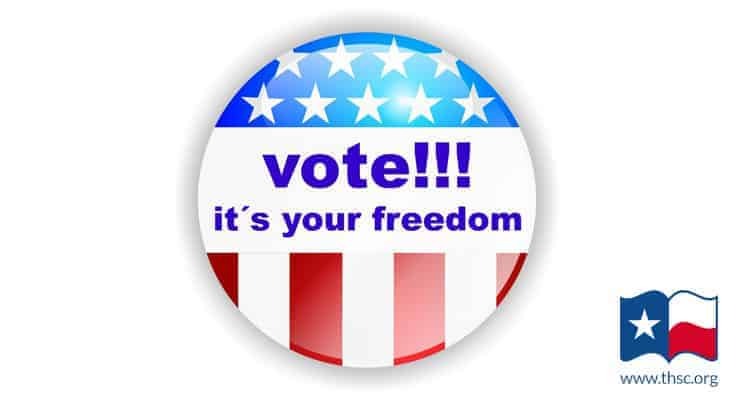 Voting is a privilege and the best opportunity for you to participate and let your voice be heard in your government. Perhaps you participate every election. But do your friends? Please share this valuable information with your friends on Twitter, Facebook, email, or any other way available to you. We need to get the word out so we can continue Keeping Texas Families Free. Nancy Dillard is a former school teacher and musician who describes herself as a Christian, conservative, Reagan Republican. She has been active in Texas politics since 1986 in local, county, and state campaigns and elections as well as serving as an election judge. Her early involvement included leadership in Christian Coalition, local GOP women’s clubs, and other organizations. She has received many awards and commendations from county and state organizations during her many years of political activism and volunteer service.